“What, will these hands ne’er be clean?” Thus quoth Lady M, stained with the blood of King Duncan. And thus quoth I after dealing with this week’s glut – beetroot. Purple, orange, white, stripy, round, flat, long, short – beetroot comes in all shapes and sizes and isn’t all meant for the pickling jar. I’ve grown the classic Detroit variety this year, but I can also recommend the very beautiful Chioggia which has pink and white rings inside it and is jolly pretty atop a salad. Some golden beetroot has come my way too this week, which does make the glut look even more stunning, but only adds to the volume of beetroot to dispatch. If you have a juicer: chuck it all in, whizz it and drink it. If you don’t – and I don’t – then it’s a bit more work, but still worth it. Mix it all up, leave it to infuse for a few minutes then strain through a sieve into a glass and enjoy. Lunch is a toss up between the quite wonderful Valentine Warner with his perfect pairing of sweet roasted beetroot and tangy green sauce (here’s his recipe) and the equally yummy River Cottage beetroot tarte tatin (here). It has to be Val, right? Afternoon snack and it’s time for crisps. Shave the beetroot into big disks using a speed peeler or a mandolin if you’re brave. Toss the shavings lightly in a little drizzle of olive oil and season. Lay out on a silicone sheet and roast at 210 degrees for around 8 minutes. Keep watching them: it’s a fine line between crispy and cremated. Next assemble the dish. 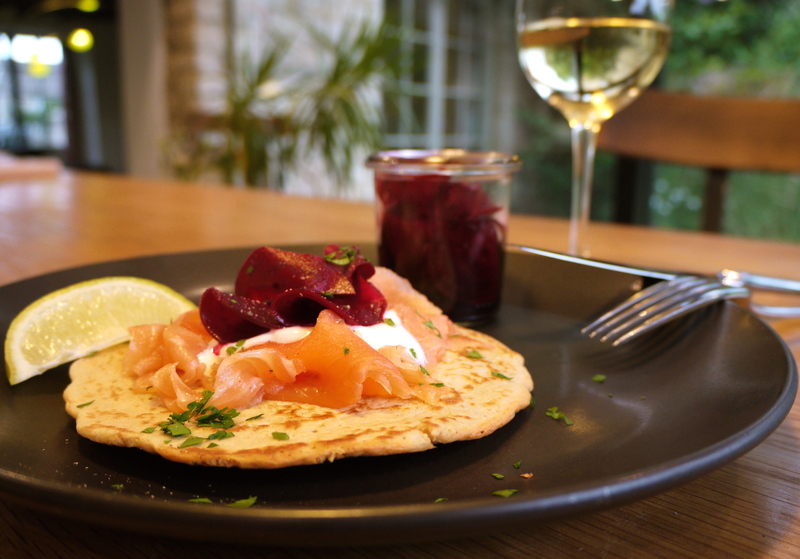 Warm the blinis briefly in the oven then pile the salmon, beetroot and yogurt on top. Finish with a twist of pepper and a squeeze of lemon juice. 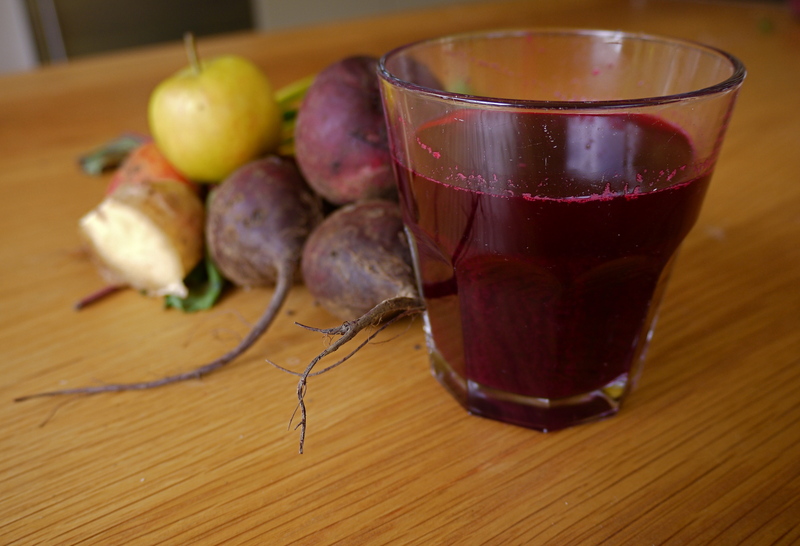 The beetroot juice with apple and ginger sounds fabulous – I’d be more than happy to have a glass for breakfast… just so long as there was some some toast involved too. Thanks! It’s a goodun. Though it does give you purple teeth and lips. Not ideal for the start of a working day so save it for weekends! 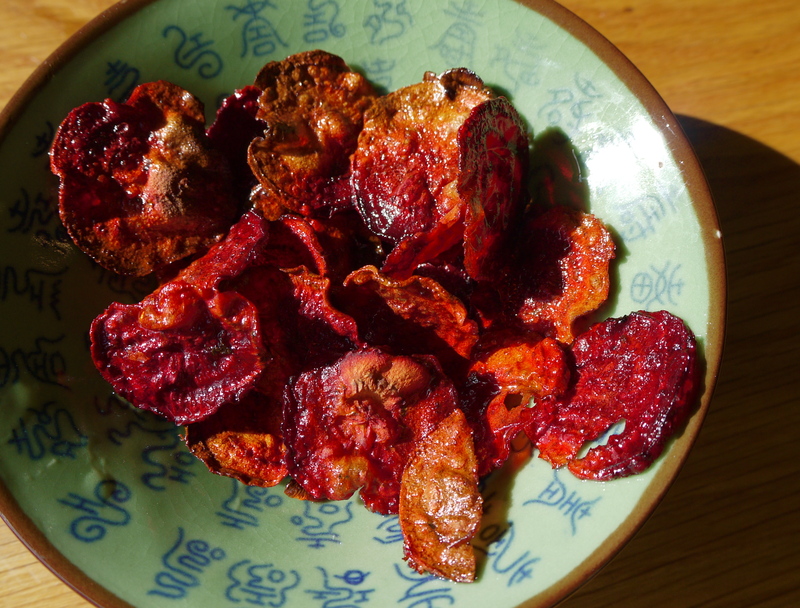 Beetroot crisps, how could I not have thought of them! 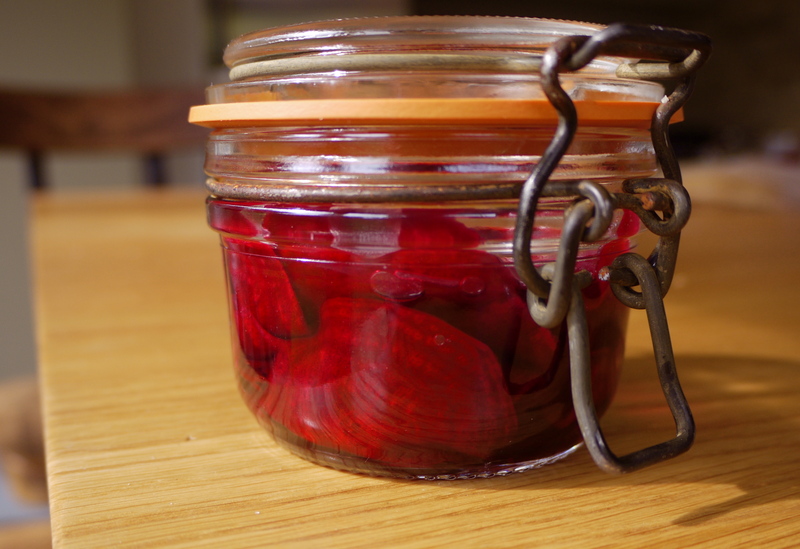 I have a beetroot glut too, love it but am very grateful for some new ideas.